Apple Barn, Bacton Hall Holiday Cottages in Bacton, Norfolk sleeps 2 people. 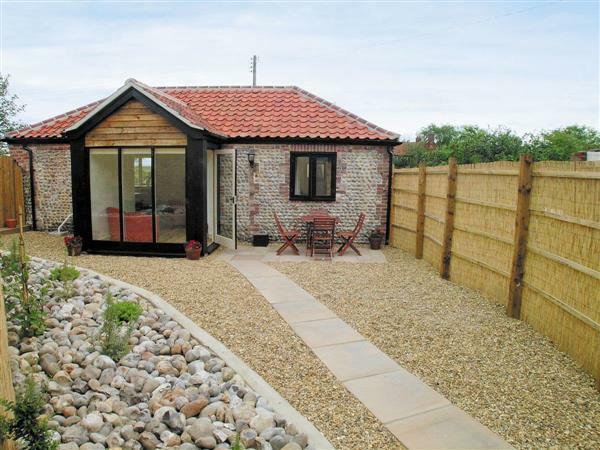 These detached, converted, flint properties (refs CAAW, CAAD [The Coach House]) offer stylish comfort and sea views in a peaceful, rural setting yet are only a ¾-mile walk to long sandy beaches. Although they are set in the grounds of Bacton Hall, where the owner lives, The Coach House has its own drive and parking for 2 cars and Apple Barn has its own parking space for 1 car. Both properties have their own secluded sunny courtyard garden area. An ideal location for walking and cycling with miles of quiet lanes in this peaceful area of Norfolk. Close to the Norfolk Broads, nature reserves, golf courses, steam trains and the historical city of Norwich with its cathedral, cobbled streets and shops. There are also National Trust properties locally including Blickling Hall and Felbrigg Hall. Shop and pubs ¾ mile. Beamed living/dining room with sea views, wood-effect floor and spacious kitchen area. Double bedroom with en-suite shower room with double shower cubicle and toilet. For a better idea of where Bacton Hall Holiday Cottages - Apple Barn is, you can see Bacton Hall Holiday Cottages - Apple Barn on the map below. Bacton Hall Holiday Cottages - Apple Barn is in Norfolk; should you be on the lookout for a special offer, you can find all the special offers in Norfolk. It's always worth checking to see what is on offer at the moment. Do you want to holiday near Bacton Hall Holiday Cottages - Apple Barn (CAAW), you can see other cottages within 25 miles of Bacton Hall Holiday Cottages - Apple Barn; have a look to find your perfect holiday location.